I love, love, love teaching with my magic cards. Magic cards will make your life easier too. They’re just a stack of index cards with student names written on them, but I use them for SO MUCH! I made Magic Cards even more magical by separating out speaking, listening and reading grades. Here’s the updated post! To Prep: Pass out a card to every kid and ask them to write their name on it. Collect cards. Done. That’s it. My first year of teaching I wrote out my students’ names on every card (150!) and then I wised up. Ain’t nobody got time for that! 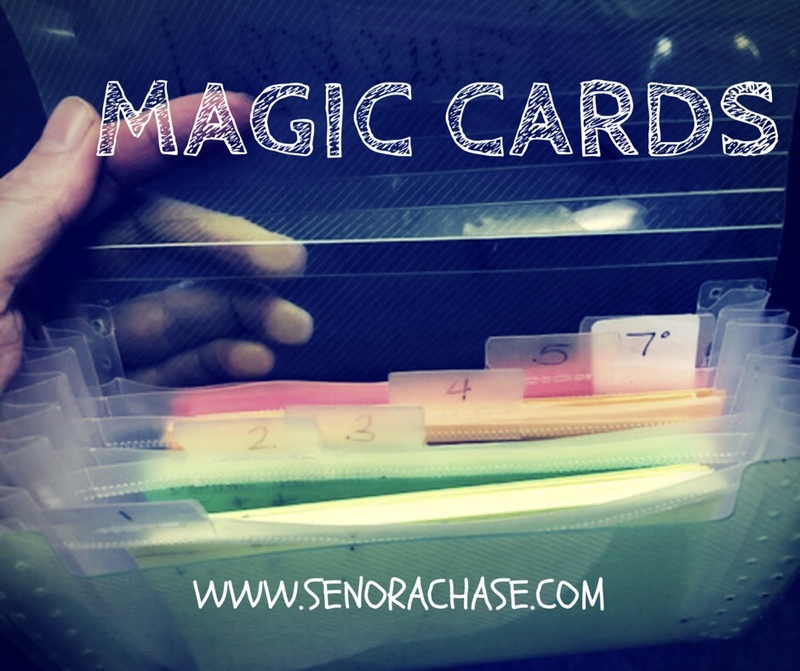 -Buy a coupon organizer to keep the cards. I got mine at the Dollar Tree 12 years ago and it’s still going strong! -Use a different color for each class, that way if the aforementioned coupon organizer falls it will not take you three weeks to sort out the cards by class. Don’t ask me how I know this. To Use: The main reason I use the Magic Cards is to randomly call on students. It’s no different than pulling numbered Popsicle sticks out of a jar or any other way to randomly select students but you can write scores on the index cards! When I pull out the cards, my little darlings know I mean business. When I call on a student using the card, I will give them one of three marks on their card, based on their response. Plus sign- Excellent. The student showed comprehension of my question and was able to answer in Spanish. Check mark- OK. The student needed a bit of help (maybe I rephrased my question or the student needed some assistance answering). Minus sign- Not good. Basically I only give students a minus if they’re off in La-La Land and have no idea what’s going on. At the end of each semester, I will put a 50 point grade in the grade book called “Oral Participation Score” and I’ll look at their cards to figure out their semester grade. All plusses is an A, mostly plusses with a few checks is a B, all check marks is a C. It’s not very scientific but it gives me a good data to determine the grade, and since I hate grading and don’t have very many grades in the grade book, it makes me feel better at the end of the semester. At the end of 1st semester, simply draw a line under your marks and begin marking below the line for 2nd semester. An unexpected bonus: Once, years ago, I got an angry phone call from a mama who told me that I didn’t like her daughter and never called on her during class. I was stunned but as soon as a regained my bearings, I asked here to hold for just a moment while I fetched my Magic Cards. I pulled out her card and I was able to explain to the mother using concrete data that I had called her daughter 17 times this semester, and 13 of those times, she was not engaged with the class and could not respond to my question. Pro Tip: Don’t be predictable about how you draw your cards from the pile. If you call the student on the top of the pile, then put his card at the bottom, he will know that it will be a looong time before you call on him again. I like to cut the deck and draw from the center. Keeps them on their toes. Also, you can flip through the cards to pick a card with not very many marks on it or skip over a card that you’ve already given a lot of marks to. I also adjust my question based on the student I will call- I want all my kids to be successful, so I might ask a more detailed question to one of my High Flyers and a Sí/No question to a student who struggles. Of course, ask the question before calling on the student, just to increase engagement. I use my Magic Cards often: Review story details, Weekend Chat, discussions during MovieTalk/ Picture talk, to establish details during story telling, to summarize during class reading, to put students into teams for a game, to create random seating charts. I also find with quiet classes who are resistant to participating, the Magic Cards really help. Such a simple, yet useful and personalized way to check for understanding. I’ll get my set ready!